There is only one reason I would ever deign to tell you about some boring old text adventure, and here it is: Scapeghost is awesome. For one thing, the game is well-written—we hardly get to applaud computer games for good writing anymore!—and for another, it is authentically creepy. A lot of the creep factor is indebted to the atmospheric artwork that accompanies each new location’s block of text. (One 1990 review calls the VGA art “photorealistic,” which, no, but all the versions really are very good.) 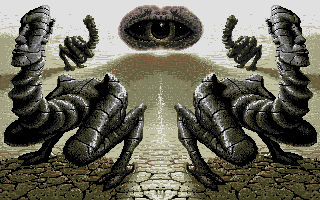 You can’t interact with the pictures—that’s the sort of thing you’d find in Déjà Vu, a super-duper-early Macintosh point-and-click adventure game—but each backdrop goes a long way in establishing the setting’s grim moodiness. You were Alan Chance. You were a good cop; now you’re a dead cop. You were trying to bust a dirty drug deal and now, in death, everyone assumes the worst about you. You wake up at your own funeral. You can practically taste the mist. From the get-go, this adventure is slim on real mystery. If you already know to follow the one especially-suspicious dude, he basically confesses to your murder under his breath. God, why do murderers always talk to themselves? I ask you. So you already know the identity of the two-timing detective who offed you. All that’s left is to vindicate your own death… FROM BEYOND THE GRAAAAAAVE. I don’t mean to be ungrateful, but all these properties have been terribly mishandled since like the late 1990s or whenever. Listen, you: we still really want to play these dumb old games. We consistently pay for the privilege. Sure, remakes and homages are a little squirrelly, but litigious smackdowns are some way to repay our love. If the titles’ original developers had any complaint about any totally amazing project, that would be one thing, but honestly, we all know the franchise creators have been shorn away from their own work for at least a decade. It’s OK to wring the last drops of money out of whatever you have, but just don’t be obvious about it. Oh my gosh, what am I trying to say? Just, like, try not to be dicks about stuff when we’re all looking directly at you, right? But yeah, thanks for the inch here, the inch there, OK, because we live for that. And oh, yeah! Sarien.net is coming back, sort of. Sorry I sound so annoyed about it; I’m really not. I was looking something up online when I fell upon these really excellent gameplay videos by Bruno de Figueiredo (AKA “dieubussy,” AKA the Eastern Mind guy). And I was really gladdened to see the videos because, not only do they illustrate PC games that are harder to obtain and get running, but these games are also absolutely essential non-games. All three titles are contemplative by anyone’s standards, but they feel especially slow now. Speaking of Toonstruck—I know we actually weren’t, I’m just changing the subject—I love that, beginning in 1993, Tim Curry and Mark Hamill apparently both decided to each try outdoing the other at Being in the Most Video Games Ever. Anyway. Rumor has it Ripper is pretty OK, and God knows I love Gabriel Knight II, along with everybody. So now I am trying to think of other suspense/horror FMV PC games. There’s Tim Curry’s Frankenstein, the Phantasmagoria games (the sequel is supposedly SO AMAZING and trashy), and… And… How many games am I forgetting? What I remember most clearly about The Dig is my associated feelings of disappointment. 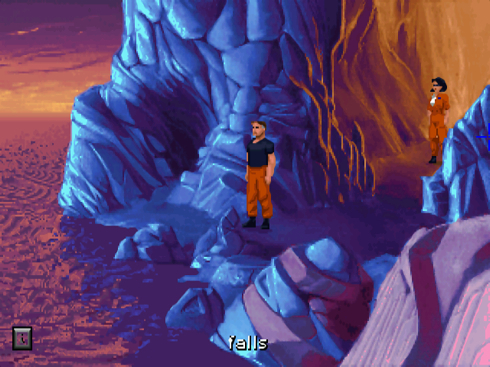 The 2D point-and-click adventure game—released in 1995, soon after Myst—had beautiful, painterly, 1992-era graphics. That is to say, upon its release, The Dig was already dated as hell. 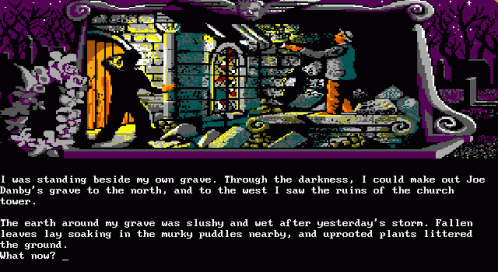 I was 13 when I played it—The Dig had been in development since I was 7—and it was the first time I’d played an adventure game so “on rails,” so “cinematic,” so a series of narrative moments and cutscenes, each one waiting for your trigger. I remember consciously thinking, “This game doesn’t even need me! It can just play itself if it wants to!” I’d felt, at the time, that the game was, somehow, overly directed, somehow too controlling and too, too linear, and I’d wondered if that wasn’t maybe because Steven Spielberg (!!!) was too protective of The Dig’s storyline. I was frustrated. What’s interesting, though, is how well the too-dated parts of the game have aged: the 2009 eye can’t tell the difference, I guess, between 1992 and 1995. And contrarily, as John Walker notes in his excellent Dig retrospective for Eurogamer, the 1995-era stuff—those little moments of then-impressive CGI—look comparatively cheesy next to the game’s painted backdrops and setpieces. Perhaps other aspects of the game have withstood time, too. 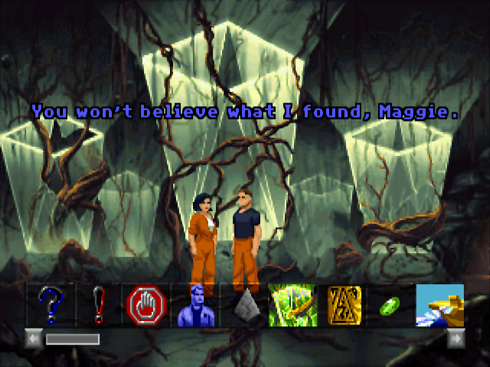 Maybe the game’s painstakingly planned moments of revelation, and all its meticulous exchanges of dialogue—which, in 1995, were irritating and aggravating for an old pro with her very set ideas of how an adventure game should play and feel—can be accepted and amended by a 2009 eye and ear as simply part-and-parcel of “the way adventure games were back then.” In his article, John Walker even applauds those moments for their capability at pushing a story forward. It isn’t that I feel at odds with John Walker’s retrospective—I really don’t—but I do wish I hadn’t played The Dig in 1995. If I hadn’t, perhaps I could play it now with Mr. Walker’s fresh, wide eyes. But [that’s] not what I’ve taken away. What I’m left with is the feeling of isolation, the ambient loneliness, and most of all, of a sense of the potential for gaming to slowly, carefully tell a story. I will say this: I do remember that feeling of alienation, some intrinsic melancholy, in playing The Dig. I’m relieved that Mr. Walker felt that, too, because for years after, I had—perhaps narcissistically—misattributed those feelings to simply being a 13-year old girl, and to being the sort of 13-year old girl who sits all cooped up, hours at a time, with a CD-ROM spinning and spinning in front of her. Edit: Chris “Papapishu” Person left a really incredible, illuminating post about The Dig in the comments. I’ve never done this before, and I apologize: I edited his comment, albeit only slightly, and I’m linking to it here. Perhaps you are wondering why Infinite Lives is being updated with alarming consistency! It is because I have the flu and a fever, and I am in bed and bored. But besides trolling the Internet for items of interest, and coughing, I’ve also been looking around for abandonware DOS games to install. My current squeeze? 1987’s The Fool’s Errand. The 1987 puzzle game seemingly builds itself around the Tarot—which itself has an inbuilt sequence and circular narrative—beginning with the Major Arcana and then moving toward made-up arcana like ‘the Humbug’ and ‘the Not-A-Merchant’. I remember the first time I saw Mass Effect in action, months ago. Here was a game where you could travel from solar system to solar system, exploring worlds in your ATV and interacting with alien races. And I couldn’t help but feel that I had done this before, years ago, with the Genesis. 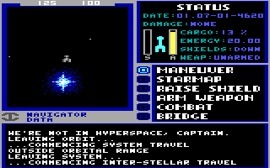 Starflight is a now-obscure EA game that originally saw release on Microsoft’s old DOS platform, before being ported to the Genesis and a slew of other computers systems, where you essentially traveled through the galaxy, exploring planets, meeting aliens, and either talking with them and getting information or blasting each other to bits. Part of the appeal of the game is simply how fleshed out the world is; each of the alien races have histories together, and each will tell you slightly different stories about one other and themselves. Some will come after you for having a particular species of crew member on your vessel, while others will just try to blow you away immediately.